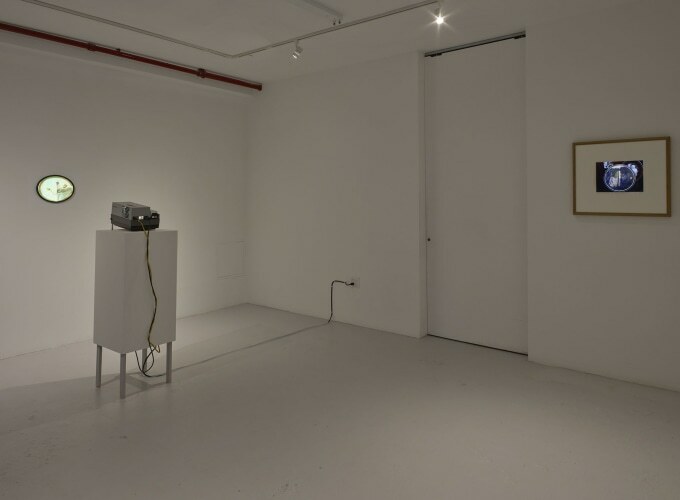 GRIMM is proud to present the first solo presentation of works by Ger van Elk (NL, 1941 – 2014) to be shown in the United States in 30 years, since his solo exhibition at the Museum of Modern Art, New York(NY) in 1975 and his solo exhibitions at The Art Institute of Chicago (IL) and Marian Goodman Gallery, New York (NY) in the 1980s. 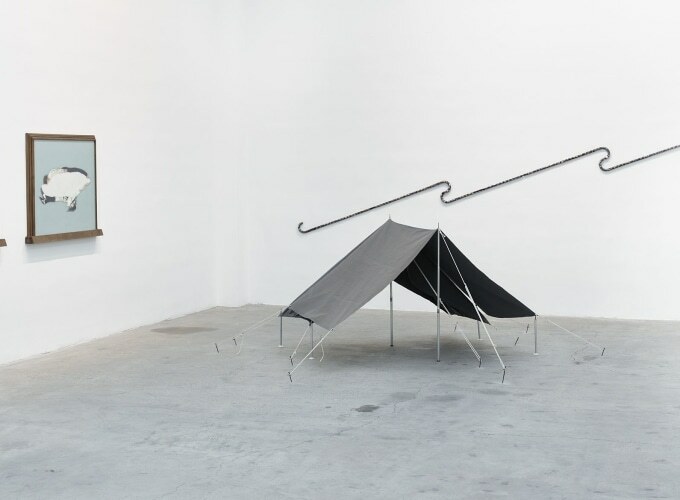 Van Elk is considered to be one of the pioneers in the Conceptual Art movement, although he never committed his practice to a singular classification. 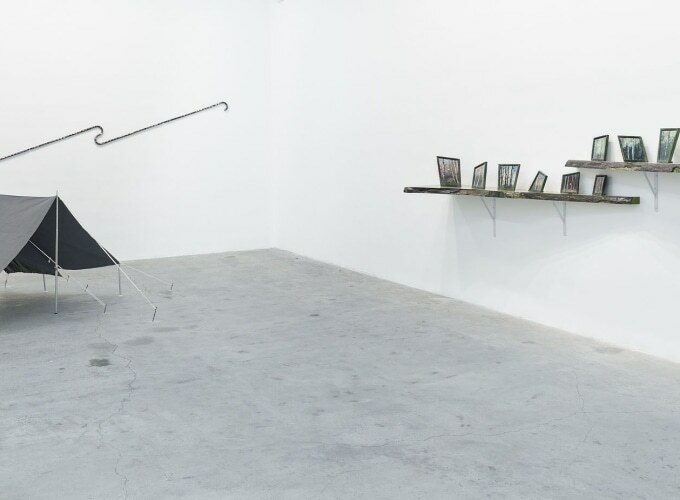 His multifaceted oeuvre ranges from Arte Povera to Pop Art, from minimal site-specific interventions to innovative video presentations. Van Elk was active in the defining stages of an international generation of artists in the 1960s and partook in groundbreaking exhibitions such as When Attitudes Become Form and Op Losse Schroeven (both in 1969). Throughout his career, which spanned over five decades, Van Elk explored the limits of image-making and its relationship to reality, reconfiguring ordinary scenes and bringing them into the realm of the absurd with simple and efficient gestures as quotidian as the scenes themselves. 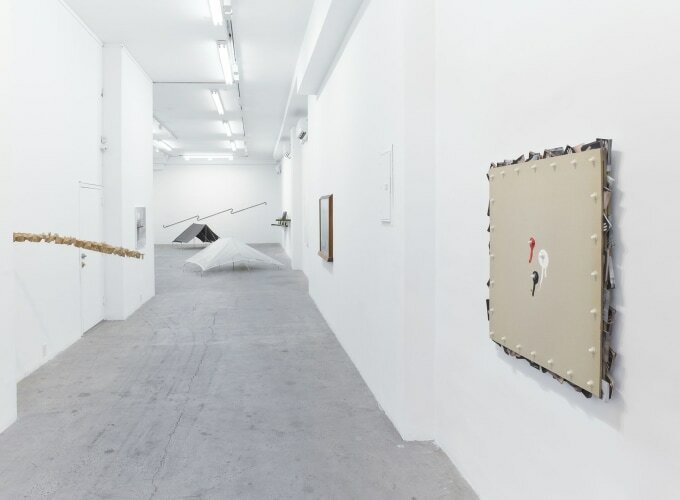 His style has been in constant flux, embracing new techniques and innovative media, whilst maintaining a dialogue with the history of art. The exhibition starts on the ground floor with a series of self-portraits such as his iconic The Co-Founder of the Word O.K. (Marken) nr. 6 (1971/1999). Where, in the archetypical Dutch village of Marken, the artist is walking with a smoked sausage dangling on a stick over his shoulder presented as a knapsack to personify the American expression to be ‘O.K.’. This work is the perfect example of Van Elk’s typical Dutch humor and absurdism often present in his work. Also featured are three works from his Sandwich (C de X) series where Van Elk has painted over a photographic composition in which pulling, pressing and pushing movements are embodied by the artist’s own figure. In The Missing Persons(1976) Van Elk is portrayed twice in formalattire seated in a parlor transfixed by an empty lounge chair - presumably all that remains of a redacted occupant. 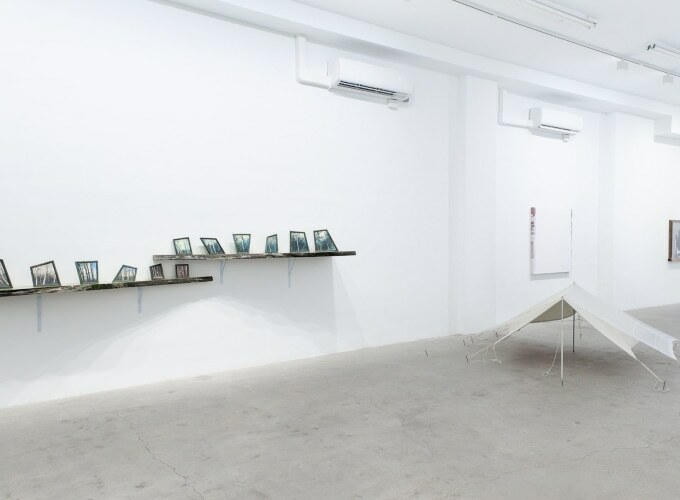 Van Elk reminds us that pictures are unreliable and that truth and reality in art do not exist. For the second part of the exhibition works have been selected that reflect Van Elk’s fascination with landscapes and more specifically the horizon. 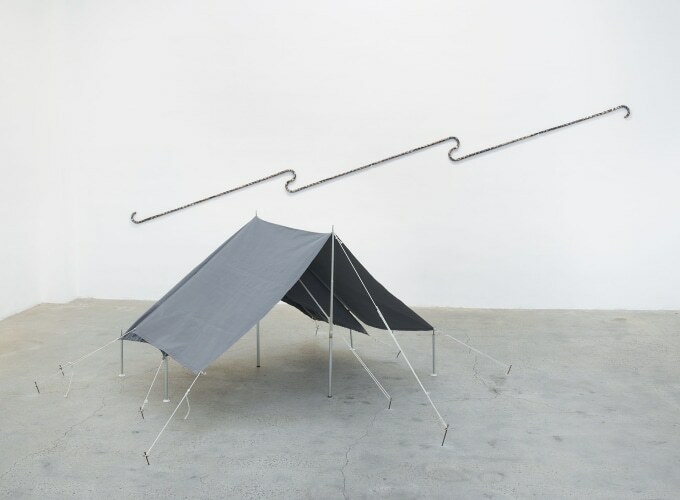 From his Camping Artsculptures of the late ‘60s to the Rotterdam Horizon from 2000, Van Elk often brings the landscape that has inspired many artists before him to the realm of contemporary and conceptual art. Exemplary is his Laantje in Middelharnis van Meindert Hobbema(1979) that takes inspiration from a well-known 17thcentury Dutch landscape painting in the collection of the National Gallery in London (UK). Two stacks of photographs of trees are mounted on steel rods coming off the wall, creating a three-dimensional photographic representation of a two-dimensional painting and encapsulating Van Elk’s walk through a typical Dutch landscape. The Conclusion series (2008-2012) consist of painted-over photographs of different urban and rural landscapes, a historically Dutch genre, that is pulled into abstraction by the multiple layers of paint. The color of the acrylic paint used is based on the dominant color of the scenery. The landscape of the photograph becomes invisible, but the brushstrokes in the paint form a cloudy pattern that constitutes a new landscape. The title of the series, Conclusions, implies an end. Possibly the end of painting, or photography, but the blank canvases can simultaneously be seen as new beginnings. Downstairs the exhibition continues with a selection of Van Elk’s video works. In his iconic The Rose more Beautiful than Art, but Difficult, therefore Art is Splendid (1972) the hand of the artist is projected into a picture frame on the wall. Constantly rearranging the flowers in a vase, Van Elk is introducing movement to a tradition of still-life painting. 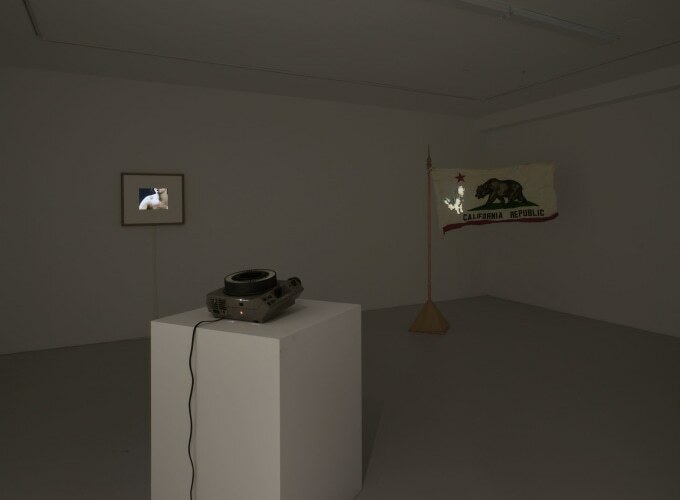 Another key video work from Van Elk’s oeuvre, Niet werkelijk Woef (1987) depicts a barking German shepherd projected onto the state flag of California. 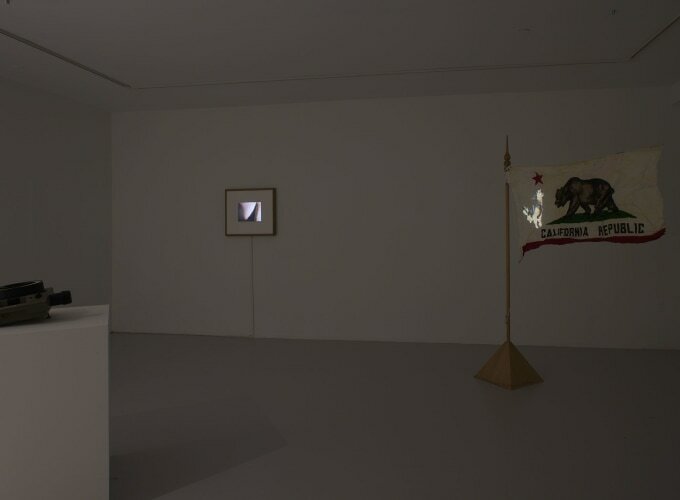 With this installation Van Elk humorously responds to an argument between two of the principles of the Stedelijk Museum at that time, Rudi Fuchs and Wim Beeren –the barking dog representing Fuchs and the Californian bear is used as a metaphor for Beeren. Van Elk was never shy of an argument, certainly not an artistic one.